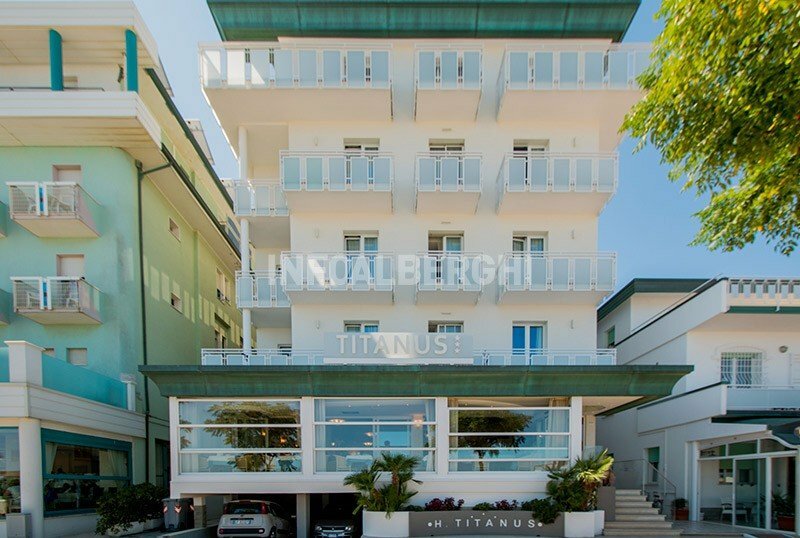 Located directly on the seafront, the family-run 3-star Hotel Titanus in Bellaria features a panoramic terrace, private parking and free Wi-Fi. The structure is equipped for cyclists and admits small animals. The hotel is located right on the beach of Bellaria, with direct access to the bathing establishments. In a few minutes walk you can reach the center of Bellaria, full of bars, restaurants, pubs and shops. They have a side balcony with sea view, air conditioning, ceiling fan, WI-FI internet connection, satellite TV and 32 '' LCD digital terrestrial, safe, direct telephone and private bathroom with shower and hairdryer. Equipped open-air porch, free use of bicycles, panoramic terrace with sea view, bar area, reading room with newspapers available, elevator. Laundry service is available upon request and subject to charges. The structure is equipped for cyclists. PARKING: uncovered for all, covered with limited places. BREAKFAST: buffet with a wide variety of homemade desserts, yogurt, fruit juices, mixed cold cuts and cereals. LUNCH AND DINNER: 3 choice menu with meat and fish dishes served in the panomarica dining room with sea view. At meals there is always a buffet of cooked and raw vegetables. Water, wine and soft drinks at meals. In the hotel: entertainment, strollers and bicycles with child seats. On request pediatrician service (for a fee). In the room: cot and fall protection rails. At meals: table chairs, baby menu, baby food, homogenized and afternoon snack. The structure has an agreement with the beach Paguro Beach, located just in front of the hotel, and equipped playground areas, baby club, entertainment, bocce courts, ping pong tables, beach volleyball and beach tennis courts.